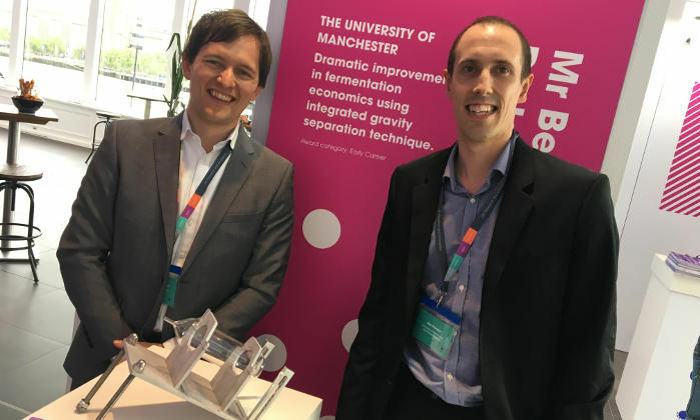 James Winterburn, Lecturer in the School of Chemical Engineering and Analytical Sciences, and Ben Dolman, PhD Student in the School, have successfully won a prize of £10K in the “Early Career” category of the BBSRC’s Innovator of the Year awards 2018. Now celebrating its 10th year, the BBSRC’s competition recognises and rewards individuals and small teams who have harnessed the potential of their excellent research. The award was given to James and Ben for the development of a novel biosurfactant separation process, which they are commercialising through a newly formed spin out company “Holiferm”. The awards were presented by Professor Malcolm Skingle, Director of Academic Liaison, GlaxoSmithKline Ltd and Professor Melanie Welham, Executive Chair of BBSRC at a high-profile event in London on 16 May 2018 in front of an invited audience of leading figures from the worlds of investment, industry, government, charity and academia.